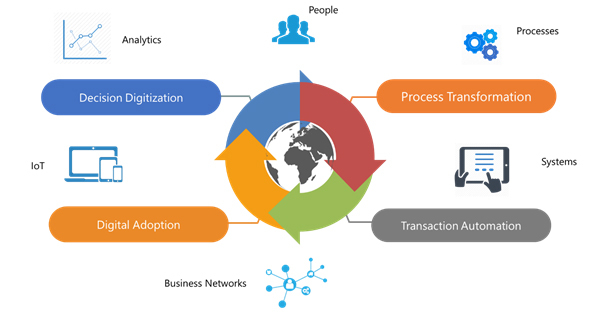 Business Process Transformation and Automation are two sides of the same coin and Companies Globally are looking for Partners who can integrate the Transformation services with the Automation services. Process Automation, typically represent ERP implementations and there can’t be a better time for both the Company and to the Partner to embark on Process Transformation. However, unfortunately experience says that the Transformation part is neglected while the term is used as a great marketing and presales term. Now, with the advent of Big Data, Data Sciences and Analytics in a big way and Companies realizing the value of Data monetization thru exploring the hidden stuff in the vast data that is populated over a period of time from several sources and for a comprehensive picture, combining this data with external sources data has assumed paramount importance. Converting the Data to Information, Information into Interpretation and Interpretation into Action items is the key. The importance of processes, the need to elevate the Business chain into a value chain, how the performance measures are directly proportionate to the underlying processes, the urgency to move from a very qualitative measure to quantitative measures, what are these measures, how can we compute them, predict them, simulate them under several probabilistic values and creating a Data driven organization are some of the areas that needs focus. The 2 words, which are commonly projected yet not understood fully in its true perspective, are “Business Value” and “Digital Transformation”. Consistent revenue growth year on year, increase in the Market share, diversification of product (or service) portfolio and entry into new markets symbolizes value enhancement of the firm. A key enabler in ensuring this is the availability of a robust – agile – responsive IT environment within the organisation – one that positively impacts the Key Performance Indicators (by which the organisation would like to measure itself) and success of the organisation. Companies in their quest for achieving continuous and consistent business value and thus paving way for creating sustainable competitive advantage are realizing how important it is to align Processes and Technology while ensuring a complementary relationship between these two. To create sustainable competitive advantage and enhancing the Business value of the Firm represent a converged view of all the objectives and goals, the company has set for itself. These two drivers form the basis of an organisation’s “Business Transformation Success Goals”. Contextualising Intelligence in this manner and managing real time tasks and integrating changes in (to) the process / processes on the fly to gain agility and competitive advantage is the true definition of Digital Transformation. YASH is engaged with organisations in strategizing, developing and deploying Digital Transformation Platforms that helps drive innovation, competitive advantage and sustained success. I will write on all these with some regular periodicity and discuss ideas that are shaping the “fast evolving” digital-first world. great work, haaѵe a nice afternoon!